The British climber Arnold Louis Mumm (1859-1927), a London publisher, first came to Canada in 1909, at the invitation of Alpine Club of Canada director Arthur O. Wheeler. 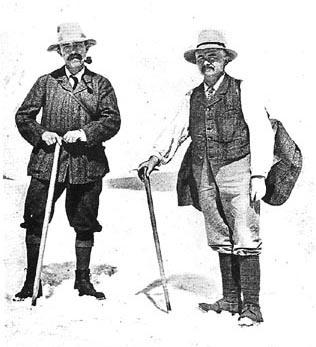 After attending the 1909 ACC camp at Lake O’Hara, Mumm, along with Leopold Charles Maurice Stennett Amery, Geoffrey Hastings, and Inderbinen, made an attempt on Mount Robson. On their way to the mountain, they met George Kinney, who reported that he and Donald Phillips had been successful on their own attempt (a claim later disputed). Mumm’s party, hobbled by difficulties of the route and lack of time, was not successful. Mumm returned with British professor J. Norman Collie in July, 1910, when the Grand Trunk Pacific Railway’s steel had been laid as far as Wolf Creek, about one hundred miles east of the Yellowhead Pass. The party spent some time about Mount Robson, but there was so much snow on the mountains and the weather was so stormy that climbing was out of the question, and they were able to ascend only some of the lesser peaks. They returned down the Smoky and Stoney rivers. The next summer, 1911, Collie and Mumm made another trip, the first to go north of the Athabasca to exploren and climb. They ascended the Stoney River, crossed a high pass to the Smoky, then up Glacier Creek, which they ascended to Mount Bess. Their reports of this unexplored country aroused much interest in alpine circles. In 1913 Mumm decided to climb Mount Geikie, which three years earlier, when on Yellowhead Mountain, he had seen rising far above its fellows. He was turned back by a storm. Mumm made many climbs in the Alps, Canada, Japan and New Zealand, in addition to accompanying Tom G. Longstaff to the Himalayas. Fay, S. Prescott. “The Canadian Rockies between the Yellowhead Pass and the Peace River.” Appalachia 13, no. 3 (1915). Mumm, Arnold L. “An expedition to Mount Robson.” Canadian Alpine Journal 2, no. 2 (1910).